A long while back I found out that mythtv supports capturing video over firewire. The idea is that as long as one has a cable box where the jack is turned on, it will spit out the complete video and audio signal for whatever channel you are currently watching, even if it’s HD. Although I didn’t think my current mythtv machine (Athlon 1700+) would be fast enough to play back HD, I could still use the firewire connection to change channels instead of my current unreliable IR method. I bought a cheap firewire card, and it worked. So I knew that, one day, I could upgrade the machine and get full HD. The upgrade was pretty smooth. Here are the steps. Also install old firewire card since mobo only has one connector. Set up new LVM for mythtv data, joining the bulk of the old 160 gig drive and the new 500 gig drive. Wrestle with firewire for a long time trying to get a signal. Peruse the mythtv wiki, which contains good solutions. It took a full, busy day, most of which was spent copying the old data and trying to get firewire to work. 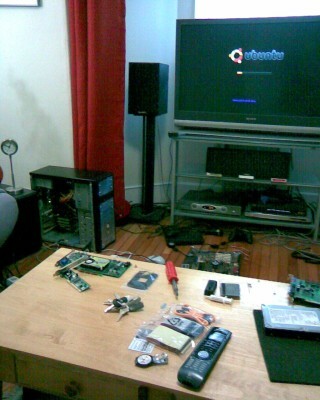 Everything else was pretty low-impact, including such previous headaches as installing mythtv and configuring mysql. It’s still way too hard for the average user, but at no point did I feel like I was breaking a sweat. I’ve spent a lot of time with mythtv so I know where a lot of the “unbreakme” buttons are. I know I have to set this up, or tweak that option… things that should be defaults but aren’t. I’d say 90% of the difficult stuff was because I was transferring old data and had permissions issues. If this was a new install, the only blocker would have been the firewire issue. All in all, a day well-spent, and now I can record and play back native HDTV streams like they were youtube videos. It’s been a long time since I’ve been able to spread hardware all over the floor. Did I mention this cost me 350$? Compare that to the competition.